Matthew Smoral is a southpaw who stands 6-8 and tips the scales at 220 pounds. 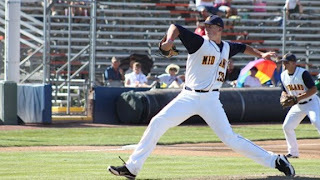 He attended Solon High School in Ohio, but missed much of the 2012 season after suffering a stress fracture in his foot. On the plus side, such an injury is not of long-term concern and is unrelated to his pitching arm. On the negative side, the injury prevented scouts from getting consistent looks at him this year. So, he's something of a question mark heading into the draft, a fact which may work to the Reds' advantage with the 14th overall pick. If he had a more established track record, then he arguably wouldn't be available outside of the top ten picks. So, the injury could give the Reds the opportunity to reel in a special home state talent. Given Smoral's combination of relative inexperience, physical stature, and potential plus offerings, he has a higher ceiling and lower floor than most top tier pitching prospects. Like all tall pitchers, Smoral will need to maintain consistency by keeping all his limbs in sync. Also like all tall pitchers, his longer levers have the potential to impart more force on the baseball than his shorter brethren. For example, if you play "crack the whip" with a 20-person chain, then you'll generate much more force at the end of the whip than if you play with a 3-person chain. The same principle applies to longer throwing arms. Smoral has efficient mechanics and no wasted movement, which should help him keep his longer levers in sync. He starts with a very small step towards third base with his right foot, which unweights his back foot and enables him to shift his back foot down onto the rubber. Once he's positioned on the rubber, he brings his right leg up into a leg kick. The leg kick comes up past parallel and involves some hip rotation to create torque. When he reaches the apex of his leg kick, he maintains good balance and gathers himself before driving to the plate. The overall tempo of his delivery is unhurried, as his delivery is smooth and seemingly low effort. However, his delivery might even be a tick too slow and speeding it up may benefit him in the long-term. Smoral does a good job of incorporating his lower body into his delivery, as he fires his hips well, which should reduce the stress on the arm as he doesn't generate velocity solely with his arm. As for the arm action itself, he uses a clean, low-three quarter arm slot. He maintains his elbow in good relation to his shoulder throughout his delivery. At times he can be a touch slow in getting his arm up into proper throwing position, but that is also a function of his lower arm slot. Overall, there aren't any injury related red flags to his mechanics, which should reduce his injury risk. 1. Smoral features a slight cross-fire throwing motion, which is due to a slightly closed stride foot position and a low three-quarter arm slot. 2. Smoral has a tendency to land on his heel, instead of the ball of his foot, when his stride foot lands, which can lead to inconsistency as the heel doesn't cushion the impact as effectively as the ball of the foot. The combination of these two issues may prove problematic from a performance point of view. The cross-fire motion means that the energy rotates around his body a bit more than is ideal. Instead of delivering all the force he builds up directly to the ball and towards the plate, some of the energy rotates around his body. When you add in the fact that he lands on his heel, he has a tendency to spin off on his heel towards the third base side. Spinning off towards third base may lead to inconsistent lateral command for Smoral. That being said, those issues are correctable. And, refining these issues might lead to both improved consistency and a higher performance level. As for his pitching arsenal, Smoral currently features a fastball that sits 90-92 and touches 93-94 on occasion. He also works with a low 80s slider that has plus potential when he commands it. Like many dominant high school pitchers, he has a change-up that he rarely used, making it inconsistent at best and undeveloped at worst. As it stands, his current repertoire doesn't rival the best repertoires in the draft class, but it's impressive and he has more projection in his game than most others in the draft class. It's also noteworthy that Smoral seems to be farther along at this point in his development than other pitchers his height. As Smoral logs professional innings, his secondary offerings should continue to develop. As he gains strength and fills out his frame, he could/should improve his fastball velocity by a tick or two. As draft day approaches, Matt Smoral is near the top of my very short list of draft eligible players. The fact that he missed almost all of his senior year gives him a higher performance risk than the typical pitching prospect in the draft, as he just hasn't been scouted as much, but his combination of stuff, mechanics, and physical projection make him unique and a potentially special talent in this draft class.